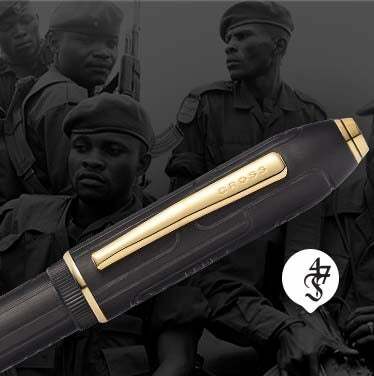 These very special Cross collectible pens are part of a series of writing instruments created in collaboration with Fonderie 47 to support the vision of an Africa free from assault rifles. The purchase of one of these pens will enable the destruction of one more assault weapon in Africa — a weapon that will never again be used to take human lives. In the last 20 years, ongoing wars on the African Continent have resulted in the loss of millions of lives. This conflict has largely been enabled due to the widespread availability of assault rifles. Fonderie 47 helps make a difference by removing AK-47s from circulation and transforming them into beautiful and exclusive luxury objects that will help fund the ongoing cause. Over 50,000 assault rifles have been destroyed to date. The craftsmen at Cross used Fonderie 47 reconstituted AK-47 gunmetal to create the fine detail work in the cap inset of the Peerless Fonderie 47 fountain and rollerball pens. These are the only writing instruments in the world crafted with Fonderie 47 gun steel. We celebrate this moment where something so beautiful can help support a cause so noble. of an AK-47 removed from circulation is featured on every pen. was transformed to create the pen's signature moniker cap inset. from war torn regions of Africa. Carry, use, and display it as a symbol of hope and change. Every Peerless Fonderie 47 Collector's Edition Pen purchase destroys 1 assault rifle and every Peerless Fonderie 47 Limited Edition Pen purchase destroys 10 assault rifles.